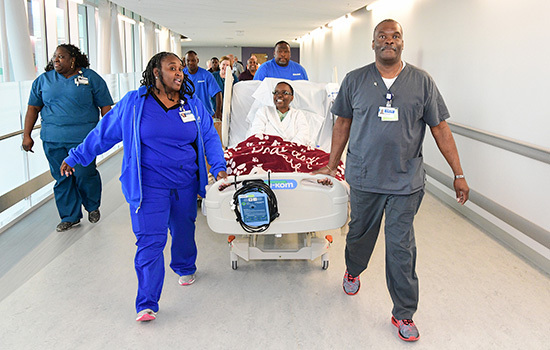 The new Emory University Hospital tower welcomed its first inpatient, Crystal McCollum, on August 26. Accompanied by her family, McCollum inaugurated one of the new spacious patient rooms designed with both medical care and comfort in mind. McCollum is being treated for a rare form of abdominal cancer by Winship Chief of Surgical Oncology Charles Staley. She was brought to the tower following surgery and a procedure known as HIPEC, a highly concentrated, heated chemotherapy treatment delivered directly to the abdomen during surgery. The state-of-the-art hospital tower, across Clifton Road from the original hospital, allows for an expansion of services and expert care, while creating an integrated and spacious environment for patients and their families. Cancer patients and bone marrow transplant patients, along with kidney, liver and pancreas transplant patients, will be cared for in the new facility, which is expected to be fully operational by the end of October.